Is #8K yet more hype to push TV set sales to unsuspecting viewers or an unstoppable new trend that is already coming? For over a year now I’ve been itching to get to off the fence. 1. TV manufacturers have always been incredibly efficient at pushing any new tech to consumers (ask any 3D set owner) — this doesn’t imply that the tech is viable, just that the market will try it, if set-makers put enough effort into marketing it, and CES 2019 announcementsand demos confirmed that this would likely happen. 2. Is 8K enough of a differentiator over 4K to justify the expense? From a resolution-only point of view, the enhancement of 4K over HD has a subjectively lower impact on user experience than the move from SD to HD had at the turn of the century. Moving from HD to 8K will provide at least as big a wow factor as moving from SD to HD did in its time. 3. Indeed, resolution is only one of many dimensions that create Video User Experience. So even if alone it does not move the market, user enthusiasm may come with a combination of factors such as High-Frame rate (above 100 fps) and 8K. 4. Even if it takes a few years to reach mass-market, early opportunities already exist in niche areas like, for example, in luxury stores. 5. Screen size and viewing distance are only a blocking point in traditional TV viewing experiences. This issue will recede as growth in average screen size remains unabated at around an extra inch of screen-size per year in most markets. 6. Furthermore, having whole walls made from screen is no longer science fiction. Samsung has been pushing modular screen technology for several years where modules are simply plugged into each other. At the same time, LG has brought screen thickness downto just a millimetre over three years ago so screens can be stuck onto a wall. In this context, overall screen resolution will need to be significantly higher than any single item it displays, including a video stream. 7. Experts are not yet consensual on this, but much of the considerable 35mm film archive around the world can be rescanned delivering resolutions higher than 4k, 70mm film can be rescanned at at least 8K. 8. 3D-video in the living room is a failure many would like to forget. It turned out just too complicated, needing special glasses and new content for a few fleeting moments of a wow effect. More 3D would make people sick. A major driving force that got so many people excited was the immersive effect. If you haven’t yet seen an 8K demo up close, you need to get to a store where they have one. If you just let your senses take over, it is a truly immersive experience. The extreme level of detail gives a sense of depth that regular video cannot compete with. It has the potential to do this for any piece of content for however long the filmmaker wants. But will 8K offer another hype wave to ride? Like most industry observers I believe the hype cycle exists, but I have also observed occasions where it didn’t materialise. I became a software engineer in the 80s. Relational databases had taken over the corporate world. In the 90s, Java became the next best thing, well since coffee. It was based on object-orientation (OO), and I expected OO to become the next upwardly mobile hype cycle to ride. I proudly pushed the concept on my CV assuming that was my career path. Nothing happened. OO penetrated the whole of IT, but slowly, without the buzz and hype I expected. When HD changed the world of video, it was a massive hype generator. It’s looking like 4K is a significantly less potent marketing tool than HD was. I guess that 8K will be even more of a damp squib in terms of hype. That doesn’t change the fact that it will permeate through video workflows, just a bit more quietly. (English) No, UHD won’t go the way 3D went! Last month IHS Media & Technology Digest published a report authored by Richard Cooper on UHD stating that it could be the next 3D if the industry doesn’t get its act together. I was an early critic of 3D arguing as early as 2009 that the 3D emperor didn’t have any clothes on. Hopefully that will legitimize my total disagreement with the idea that UHD might go the same way. In my work at the Ultra HD Forum, we compiled a list of over 50 live commercial UHD services at the end of 2016. This was never the case for 3D. Continuer la lecture de (English) No, UHD won’t go the way 3D went! HDR and some NGA are here (well almost). Demos will blow your mind and ears, but beware - it can take a geek a couple of hours to get it working at home. Here is my personal account, as a simple user, of my road to UHD nirvana in my living room. I wrote this in early September 2016, and just updated it at the end of the month as I finally got Dolby Atmos working and it was worth the wait). When I moved to my new flat in central Paris 8 months ago, I immediately got access to an Orange Fibre connexion with speeds of up to 800 Mbps. With all the work I’ve been doing on UHD as a member of the Ultra HD Forum, I saw this as an opportunity to test some streaming services in the real world of my sitting room. I’ve had my Samsung SUHD TV (UE55SJ8500) for 6 months now. First demos were with still images from the UHD Zoo app, as it took me a while to get a 4K video that I could effectively stream to my TV. Of course, Netflix was available, and although some 4K series have some stunning shots that show up all the new pixels, many don’t, even though they’re in the 4K section. After having completed a white paper on Object based sound and getting excited about DTS:X (see here), I went for a mid to high-range Onkyo A/V receiver (TX-RZ 810 B ) that was already Dolby Atmos-capable and will be software upgradable to DTS:X. Having spent 1,200 € on the receiver, I was no longer ready to splash out on the high-end Atmos speaker system I’d been eying. Amazon had a 400€ set of speakers available for next day delivery so I went for an Onkyo SKS-HT588(B) system, knowing that once my system is stable, I’ll have to invest in real speakers. A first hurdle for many viewers will be that the TV set-top-box is usually set by default to stereo sound. So before getting anything like 5.1 output from that source one must find the appropriate sub-menu and set HDMI audio output to what in my case Orange calls Home cinema. The other option (yes, it’s well known that two options make things simpler!) is to use an optical output from the STB, which is always in pass-through mode, and then configure the AV receiver to associate that with the video, from the Orange STB in my case. The Orange TV service has had a single Dolby Atmos sports transmission but I couldn’t find any next-gen audio in the VoD library so to get some fancy sound demos, back to the Internet where I found Dolby demo files with difficulty on http://www.demo-world.eu/2d-demo-trailers-hd/. It turned out none of my devices or software was able to send the Dolby Atmos sound track to my AV receiver. I found on an obscure geek chat that the Kodi video player could decode Atmos. So I installed that onto my Mac and Eureka!, the Dolby Demos played on my TV (connected with HDMI to my Mac). It sounded beautiful, but the Onkyo receiver never had the word ‘Atmos’ appear so I’m guessing it just considered it was Dolby 7.1, but hey, it sounded really immersive with the rain falling literally overhead, so who cares? [see update at end of blog, I did finally get the Atmos to work from the Orange VoD store]. Amazon and Netflix have some UHD content but on their own interfaces, it is so far impossible to tell whether there’s any HDR, and I understand Netflix chooses the HDR mode dynamically, so for the next demo, it seems like physical media is the only way. After waiting for UHD capable Blu-Ray players for a year, I decided to go and get one of the two available in France (The Samsung at 500€ or the Hitachi at 800€). But when I got to the retail store, the sales guy suggested I get an Xbox One S for 400€. That would also hopefully get my sixteen-year-old interested, so I went for that option. Back home with the Xbox unpacked, my next objective was to get UHD Blu-Ray disks to play and at-long-last see some real HDR. Inside the Xbox parameters, to select HDR, there is no mention (yet) of HDR itself. You need the knowledge that we are looking for 10-bit colour and so must select the 30 (!?) bits per pixel option (I later used the top 36 (12) bits options, which the TV accepted fine, and the video looked a bit better, strangely I had a better sense of very high resolution rather than amazing colours. There was no HDR wow effect with the Man-of-Steel blue ray I got for free with my Xbox, it just looked very nice. But let’s not run away with ourselves, there was a last hurdle to cross. The Xbox’s Blu-ray player said I had the wrong kind of TV for UHD. It turned out that the AV Receiver through which my HDMI signal was passing, was not HDCP 2.2 enabled. In the Inputs sub-menu of the Onkyo AV receiver, I discovered that only HDMI 1 through 3 were HDCP 2.2-capable. That required pulling the TV away from the wall yet again and reassigning the X-Box One S to one of the 3 first ports (and of course reassigning whatever was already there that didn’t need HDCP 2.2 somewhere else). I’ll spare you the screen shot of doing that in the AV receiver’s menus. Finally, on my Samsung TV I had to hunt down to the 14th menu item of the main Picture menu, called HDMI UHD Color, which everyone else calls HDR. Then within the Samsung TV submenu I turned on the HDMI ports that are connected to HDR sources. For each value you change here, the TV needs to reboot (no kidding it really does). Putting my professional hat on, I’m still a true believer in UHD and all its promises, but despite having often written about “This being the year for UHD”, I do see that there is a potential blocking point with these customer-facing issues. I trust that at the Ultra HD Forum and the UHD Alliance folks will get to grips with these interoperability teething problems so that the true benefits of UHD aren’t confined to the tech-savvy. I see a great opportunity for operators and their call centres to fix wires problems today but also for the CPE suppliers to work on processing HDR and one day NGA locally. UHD has to be plug and play to truly take off. [Update Sept 29 2016: I spent 10€ on a digital copie of Salt (Angelina Jolie) from the Orange VoD store that had about 9 other movies with Atmos at time of writing - so Yeah! I finally got my expensive A/V receiver to actually recognise an Atmos audio stream and generate the right output. The sense of immersion is clearly improved, you really can't tell what's coming out of what speaker any more and I heard sounds that seemed to come from "in front of a given speaker". Las Vegas was again focused on UHD in 2016, at least through my eayes. The four Keywords I came away with were 1: UHD (again), 2: HDR, but also 3: VR and 4: All-IP production. Of course other things like drones were important, but I'm not a real journalist, I don't know how to write about things I don't know. We got in from Europe on the Saturday evening and this year I was on a budget so we stayed in an Airbnb apartment with my colleague Marta. It turned out to be just behind the main LVCC parking lot. On Sunday morning, you can see on thE right what the parking looked like when you arrive before the show is really underway. Starting with radio shows this year’s NAB is the 94th annual Show, so I suppose in 6 years we’ll have a big bonanza, I wonder if we’ll have something like Augmented Reality in 8K by then. Devoncroft sees the global media being market worth 49bn in 2015 with the US Media industry having pushed revenue per user to the limit. 3000 vendors make up their industry panel and 2009-2015 CAGR was 1,9% with 2014-2015 OpEx spend at -4.2% and CapEx spend at -4.4%. Despite the OTT craze and losing traditional subs, ESPN still gets 7$/Month from linear subscriptions, but only 0,42$/Month from OTT viewers, so hold your hats, linear pay-TV ain’t dead quite yet. Beyond sports, Devoncroft argues that even though there is growth, digital revenues are insufficient to replace linear ones. The big issue is how the ad market can transition. 4K and UHD make up the third most import topic for respondents of Devoncroft's 2016 Big Broadcast Survey the results of which will soon be released. But Demand for UHD is less for “more pixels” than one for “better pixels”. So according to Devoncroft, like Ericsson, the HDR Vs. 4K debate is all but over. I then popped into an Augmented Reality (AR) conference where Gary Acock and Juan Salvo were discussing how to add live content to the UnReal video gaming engine. AR is seen as bringing the real world into Virtual Reality (VR). Stitching 360° video is still apparently a “pretty unpleasant experience” and French startup VideoStitch was mentioned as one of the key players working on fixing this. Currently 360° production design is limited by how effectively you can stitch video. But with AR there are also Inherent UX limitations like parallax issues with head movement or camera movement when there’s no head movement. With AR one needs to always know where the head is and how it's positioned as head movements affect the content that is being created. The amount of data to process for VR can be well over 1TB / hour so the coming (?) VR/AR revolution needs powerful GPU and CPU. AR, VR and any immersive experience are still moving targets in 2016. But neither AR nor VR are isolated from the broadcast experience anymore. Indeed VR is less of an isolating and lonely experience, but a new way of engaging, a bit like coming to a conference and interacting with social media on a smartphone at the same time. Content is still king and creating compelling content remains the goal where AR & VR are just other tools. As we still don't have toolsets like an « Adobe for AR/VR » we need to jerry-rig existing tools. A VR demo that was not at NAB intrigued me. Frauhoffer’s Stephan Steglich told me about FAME. It’s the simple idea of navigating the 360 video with a remote control. 2 key advantages are removing the isolation aspect of having to wear something over the eyes and moving all the processing to the cloud, allowing for future-proof deployments. It sounded convincing but I’ll wait for a compelling demo before making an opinion. I had been told great things about the CES Showstoppers being a big event, at my first experience at NAB, it was a very focused affair where great food and wine seemed to be as attractive for the media as the companies to visit. German manufacturer Sennheiser was showing off their latest MKE440 DSLR microphone, which they say is the first mini-shotgun for HQ stereo sound image in one take. I was more taken by the beautiful design of the prototype VR microphone that goes under VR camera. I met up with V-Nova’s Fabio Murra who was showing their two OTT deployments based on their Perseus codec. FastFilmz launched on March 26 in India offering SVoD to a mobile-only Tamil customer base with a potential of 120m subs. There were 350 titles at launch and according to V-Nova, Perseus made the business case possible in southern India where only 2G is available in some areas, offering a 64-128 kbps bandwidth. The demo I saw was watchable at 120kbps using 14 fps (I had to point that out though). The Perseus codec is described as “hybrid on top of H264” with a metadata stream on top of H264. I’ll be looking to dig into this a bit more as I no longer understand exactly what this means after a heated discussion several analysts. Content is protected with DRM I couldn’t find out by who. I only glimpsed the other demo of a 4K STB using OTT delivery. It was showing Tears of Steel at 4mbps and looked fine but without any wow effect at least for what was on screen then, or maybe it was just that I was too far away for the small screen. V-Nova had already announced a contribution deal with Eutelsat and promised another one for the next day (which turned out to be Sky Italia). The Japanese company Brother that I wrongly thought of as a printer maker (does any Japanese company do only one thing?) was displaying « Airscouter », a surprising head-mounted monitor designed for cameramen in difficult positions. You see a 720p resolution image in the corner of one eye. It was a bit disconcerting and I guess limited to some very specific use cases. I felt a bit nauseous with it on my head but it does really work and felt maybe like what Iron Man might feel. Monday was taken up with Ultra HD Forum activities for me. We had our own press conference in the morning and in the after noon I made a tiny presentation during the Pilot press conference in the Futures Park. I discussed, the forum’s reason for being, it’s history, our Plugfest #1, the Guidelines 2016 and the general « Work in Progress » aspect of live UHD. « Pilot » is new name for « NAB Labs » that was started in 2012. We were among 30 exhibitors in Futures Park, which aims to promote « Edge of the art » concepts that are not yet commercialized. ATSC 3.0 was the star with 15 companies focusing on that alone. Other stuff is very diverse ranging from commercial R&D, government to academic research. NHK 8k Super High Vision was prominent as usual and the Nippon public broadcaster is still scheduled to launch commercially in 2018 « so people can enjoy in 2020 Japanese Olympics » in glorious 8K HDR with HFR. Monday night was over-booked and I chose the Verimatrix media dinner. I had some animated discussions on UHD and the extent to which HDR might be the only big game-changer (I still believe in 4K but am feeling more and more lonely on that front). Tom Munro the CEO gave me a great update on the company strategy and how the move towards analytics, which I now understand can be a logical progression for a security vendor. If the financial transactions are precious enough to secure, then private usage data is worthy of the same efforts. More on that in a dedicated blog soon. Satellite industry on edge of a cliff and might UHD save it? On Tuesday I got myself to the Satellite industry day. I have this vision on the industry (at least the broadcast and the Telecoms parts of it) sitting on the edge of a cliff wondering when fiber, 5G and delinearization will push the off the edge. Despite a great lineup with Caleb Henry of Via Sat Mag, Steve Corda VP Bizdev SES, Markus Fritz Eutelsat, Dan Miner AT&T and Peter Ostapiuk of Intelsat, the opening panel didn’t really give me any new ideas to tackle that problem. AT&T in particular sees similarities between the move from SD to HD and that from HD to UHD, but IntelSat sobered the audience asking how the content industry will make money from upgrade to UHD. SES’s Steve Corda made it scarier still reminding the audience that during the upgrade from SD to HD we didn't have competition from OTT as we do now with most early UHD coming from OTT suppliers. The satellite industry panel agreed that demand for UHD channels is growing especially from their cable operator clients and that the bottleneck is still available content. AT&T's Dan Miner noted that a key change in OTT delivery in the coming 18 months is that US data plans will enable the TV Everywhere on cellular networks. The consensus is that to have a monetizable UHD offering you need a bouquet of at least 2 channels, ideally at least to 5 including sports. When the panel went round enumerating their live 4K services, I counted about a dozen UHD linear channels and as many demo channels as well as a few events based channels. One of Viasat’s founders Mark Dankberg gave an inspirational talk reassuring the audience that the satellite industry’s future is safe, at least if they copy Viasat. The merger of AT&T and DirecTV is an indicator to him that Satellite without broadband is no longer viable in the long term. Viasat started 1986 in defense, during the 90's they got into VSAT (Data Networking) just on the B2B side. Dankberg believes high –orbit geostationary is still the way to go (instead of mid of low-orbit (LEO)) because it’s the best way to optimize resources with thousands of beams. He points out that as 95% of demand is in 15% of geography; LEO that orbit the earth can't do that. I was enthused by his talk and hoping to get home and write a blog about it, but when I looked through my notes I realized that in the end there wasn’t any new information, just the charisma and communicative beliefs of an industry veteran. Beeniuis, the middleware guys from Slovenia that I’ve written about a few time caught me in the south hall so I went to have a look. In demonstrating their new version 4.2 core product, Beenius told me that the EPG is dead but still went ahead to show me theirs. Navigation is via genres with favorite channels on top of a carousel that mixes live and VoD. Recommendation currently uses their own algorithms but can be based on Think Analytics with « Trending » content on second line. 2. « Walled Garden » where the user chooses apps from the operator’s list typically among a dozen including YouTube, Netflix, etc. 3. Apps already embedding into the UI, which is also a closed model. VoD also benefits from integrated recommendation but is open to extra info from the Web such IMDB content. Beenius haven’t had much interaction with 4K yet, although they say they are ready. As with any competitive TV middleware you can fling content from screen to screen. The operator-controlled UI can be updated from a central server so that a new version of the App gets automatically pushed to STB via GooglePlay as soon as it's closed and reopened. Playing in the google arena has enabled a full-featured app for Android powered smart TVs, Beanies just needs Google to finally get it right in the living room. Ludovic Noblet of French institute of research B<>Com showed me a tool to up-convert SDR content to HDR. He sees it as a gap-filler for legacy setups which is already available for offline, with a real-time version planed for IBC 2016. The current version introduced a latency of just 3 images and was convincing even if it didn’t carry that amazing wow-effect of some native HDR content. He was very secretive about the first customers but seemed very confident. The LMH1219 is a 12G SDI card shown above enables SDI cables to be up to 110m without any signal attenuation, instead of the usual 20-30m. Its UltraScale processing equalizes and Improves the signal. The TI chip is agnostic to metadata so should work fine with HDR for example. Another hardware innovation they showed me was a single chip for receive (Cable EQ) or drive mode (TX) that makes BNC connectors more versatile as they needn't be just IN or OUT but can be either. The device isn’t available yet nor does it have a product name. Launch is expected in Q1 2017. Note that I didn’t interact with any of the All-IP production vendors, but just noted it as a buzzing theme in conferences and on booth signage. This article was first published in December 2015, but has been updated post-CES 2016 (corrections on Dolby Vision, UHD Alliance's "Ultra HD Premium" specification and the merging of Technicolor and Philips HDR technologies). A lot has been written about HDR video lately, and from all of this perhaps only one thing becomes truly clear – that there appear to be various standards to choose from. What’s going on in this area in terms of technologies and standards? Before looking into that, let’s take a step back and look at what HDR video is and what’s the benefit of it. Since 2013, Ultra HD or UHD has come up as a major new consumer TV development. UHD, often also referred to as ‘4K’, has a resolution of 3,840 x 2,160 – twice the horizontal and twice the vertical resolution of 1080p HDTV, so four times the pixels. UHD has been pushed above all by TV manufacturers looking for new ways to entice consumers to buy new TV sets. To appreciate the increased resolution of UHD, one needs to have a larger screen or a smaller viewing distance but it serves a trend towards ever larger TV sizes. As for audio, a transition from conventional (matrixed or discrete) surround sound to object-based audio is envisaged for the next generation of TV. Of these technologies, the first three are best attainable in the short term. They are also interrelated. So what does HDR do? Although it’s using rather different techniques, HDR video is often likened to HDR photography as their aims are similar: to capture and reproduce scenes with a greater dynamic range than traditional technology can, in order to offer a more true-to-life experience. With HDR, more detail is visible in images that would otherwise look either overexposed, showing too little detail in bright areas, or underexposed, showing too little detail in dark areas. HDR video is typically combined with a feature called Wide Color Gamut or WCG. Traditional HDTVs use a color space referred to as Rec.709, which was defined for the first generations of HDTVs which used CRT displays. Current flat panel display technologies like LCD and OLED can produce a far wider range of colors and greater luminance, measured in ‘nits’. A nit is a unit for brightness, equal to candela per square meter (cd/m2). To accommodate this greater color gamut, Rec.2020 color space was defined. No commercial display can fully cover this new color space but it provides room for growth. The current state of the art of color gamut for displays in the market is a color space called DCI-P3 which is smaller than Rec.2020 but substantially larger than Rec.709. To avoid color banding issues that could otherwise occur with this greater color gamut, HDR/WCG video typically uses a greater sampling resolution of 10 or 12 bits per subpixel (R, G and B) instead of the conventional 8 bits, so 30 or 36 bits per pixel rather than 24. The problem with HDR isn’t so much on the capture side nor on the rendering side – current professional digital cameras can handle a greater dynamic range and current displays can produce a greater contrast than the content chain in between can handle. It’s the standards for encoding, storage, transmission and everything else that needs to happen in between that are too constrained to support HDR. So what is being done about this? A lot, in fact. Let’s look at the technologies first. A handful of organizations have proposed technologies for describing HDR signals for capture, storage, transmission and reproduction. They are Dolby, SMPTE, Technicolor, Philips, and BBC together with NHK. Around the time of CES 2016, Technicolor and Philips have announced they are going to merge their HDR technologies. Dolby’s HDR technology is branded Dolby Vision. One of the key elements of Dolby Vision is the Perceptual Quantizer EOTF which has been standardized by SMPTE as ST 2084 (see box: SMPTE HDR Standards) and mandated by the Blu-ray Disc Association for the new Ultra HD Blu-ray format. The SMPTE ST 2084 format can actually contain more picture information than TVs today can display but because the information is there as manufacturers build better TVs the content has the potential to look better as the new, improved display technologies come to market. 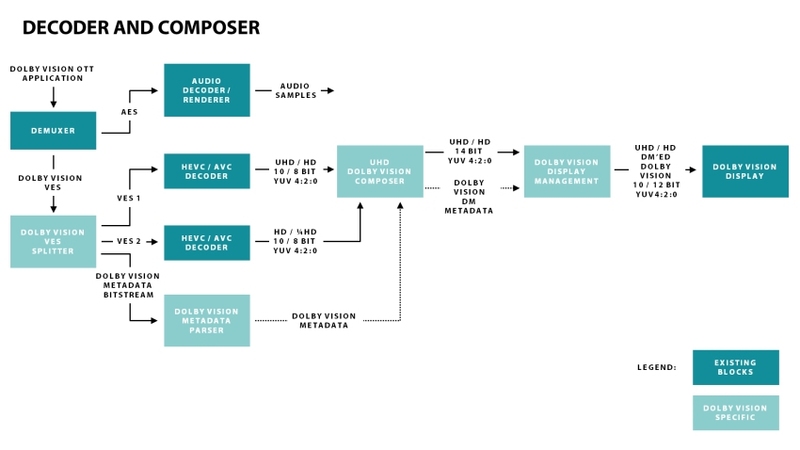 Dolby Vision and HDR10 use the same SMPTE 2084 standard making it easy for studios and content producers to master once and deliver to either HDR10 or, with the addition of dynamic metadata, Dolby Vision. The dynamic metadata is not an absolute necessity, but using it guarantees the best results when played back on a Dolby Vision-enabled TV. HDR10 uses static metadata which ensures it will still look good – far better than Standard Dynamic Range (SDR). Even using no metadata at all, SMPTE 2084 can work at an acceptable level just as other proposed EOTFs without metadata do. For live broadcast Dolby supports both single and dual layer 10-bit distribution methods and has come up with a single workflow that can simultaneously deliver an HDR signal to the latest generation and future TVs and a derived SDR signal to support all legacy TVs. The signal can be encoded in HEVC or AVC. Not requiring dual workflows will be very appealing to all involved in content production and the system is flexible to let the broadcaster choose where to derive the SDR signal. If it’s done at the head-end they can choose to simply simulcast it as another channel or convert the signal to dual-layer single stream signal at the distribution encoder for transmission. Additionally the HDR-to-SDR conversion can be built into set-top boxes for maximum flexibility without compromising the SDR or HDR signals. Moreover, the SDR distribution signal that’s derived from the HDR original using Dolby’s content mapping unit (CMU) is significantly better in terms of detail and color than one that’s captured natively in SDR, as Dolby demonstrated side by side at IBC 2015. The metadata is only produced and multiplexed into the stream at the point of transmission, just before or in the final encoder – not in the baseband workflow. Dolby uses 12-bit color depth for cinematic Dolby Vision content to avoid any noticeable banding but the format is actually agnostic to different color depths and works with 10-bit video as well. In fact, Dolby recommends 10-bit color depth for broadcast. Technicolor has developed two HDR technologies. The first takes a 10-bit HDR video signal from a camera and delivers a video signal that is compatible with SDR as well as HDR displays. The extra information that is needed for the HDR rendering is encoded in such a way that it builds on top of the 8-bit SDR signal but SDR devices simply ignore the extra data. The second technology is called Intelligent Tone Management and offers a method to ‘upscale’ SDR material to HDR, using the extra dynamic range that current-day capture devices can provide but traditional encoding cannot handle, and providing enhanced color grading tools to colorists. While it remains to be seen how effective and acceptable the results are going to be, this technique has the potential to greatly expand the amount of available HDR content. Having a single signal that delivers SDR to legacy TV sets (HD or UHD) and HDR to the new crop of TVs is also the objective of what BBC’s R&D department and Japan’s public broadcaster NHK are working on together. It’s called Hybrid Log Gamma or HLG. HLG’s premise is an attractive one: a single video signal that renders SDR on legacy displays but HDR on displays that can handle this. HLG, BBC and NHK say, is compatible with existing 10-bit production workflows and can be distributed using a single HEVC Main 10 Profile bitstream. Depending on whom you ask HLG is the best thing since sliced bread or a clever compromise that accommodates SDR as well as HDR displays but gives suboptimal results and looks great on neither. The Hybrid Log Gamma name refers to the fact that the OETF is a hybrid that applies a conventional gamma curve for low-light signals and a logarithmic curve for the high tones. OOTF: function that maps scene luminance to displayed luminance; a function of the OETF and EOTF in a chain. Because of the non-linear nature of both OETF and EOTF, the chain’s OOTF also has a non-linear character. The EOTF for Mastering Reference Displays, conceived by Dolby and standardized by SMPTE as ST 2084 is ´display-referred'. With this approach, the OOTF is part of the OETF, requiring implicit or explicit metadata. Hybrid Log Gamma (HLG), proposed by BBC and NHK, is a 'scene-referred' system which means the OOTF is part of the EOTF. HLG does not require mastering metadata so the signal is display-independent and can be displayed unprocessed on an SDR screen. The reasoning is simple: bandwidth is scarce, especially for terrestrial broadcasting but also for satellite and even cable, so transmitting the signal twice in parallel, in SDR and HDR, is not an attractive option. In fact, most broadcasters are far more interested in adding HDR to 1080p HD channels than in launching UHD channels, for exactly the same reason. Adding HDR is estimated to consume up to 20% extra bandwidth at most, whereas a UHD channel gobbles up the bandwidth of four HD channels. It’s probably no coincidence HLG technology has been developed by two broadcast companies that have historically invested a lot in R&D. Note however that the claimed backwards compatibility of HLG with SDR displays only applies to displays working with Rec.2020 color space, i.e. Wide Color Gamut. This more or less makes its main benefit worthless. ARIB, the Japanese organization that’s the equivalent of DVB in Europe and ATSC in North America, has standardized upon HLG for UHD HDR broadcasts. The DVB Project meanwhile has recently announced that UHD-I phase 2 will actually include a profile that adds HDR to 1080p HD video – a move advocated by Ericsson and supported by many broadcasters. Don’t expect CE manufacturers to start producing HDTVs with HDR however. Such innovations are likely to end up only in the UHD TV category, where the growth is and any innovation outside of cost reductions takes place. This means consumers will need a HDR UHD TV to watch HD broadcasts with HDR. Owners of such TV sets will be confronted with a mixture of qualities – plain HD, HD with HDR, plain UHD and UHD with HDR (and WCG), much in the same way HDTV owners may watch a mix of SD and HD television, only with more variations. The SMPTE is one of the foremost standardization bodies active in developing official standards for the proposed HDR technologies. See box ‘SMPTE HDR standards’. One other such body is the Blu-ray Disc Association (BDA). Although physical media have been losing some popularity with consumers lately, few people are blessed with a fast enough broadband connection to be able to handle proper Ultra HD video streaming, with or without HDR. Netflix requires at least 15 Mbps sustained average bitrate for UHD watching but recommends at least 25 Mbps. The new Ultra HD Blu-ray standard meanwhile offers up to 128 Mpbs peak bit rate. Of course one can compress Ultra HD signals but the resulting quality loss would defy the entire purpose of Ultra High Definition. Ultra HD Blu-ray may be somewhat late to the market, with some SVOD streaming services having beat them to it, but the BDA deserves praise for not rushing the new standard to launch without HDR support. Had they done that, the format may very well have been declared dead on arrival. The complication, of course, was that there was no single agreed-upon standard for HDR yet. The BDA has settled on the HDR10 Media Profile (see box) as mandatory for players and discs with Dolby Vision and Philips’ HDR format as optional for players as well as discs. The UHD Alliance mostly revolves around Hollywood movie studios and is focused on content creation and playback, guidelines for CE devices, branding and consumer experience). At CES 2016, the UHDA has announced a set of norms for displays, content end ‘distribution’ to deliver UHD with HDR, and an associated logo program. The norm is called ‘Ultra HD Premium’ (see box). Is it a standard? Arguably, yes. Does it put an end to any potential confusion over different HDR technologies? Not quite – while the new norm guarantees a certain level of dynamic range it does not specify any particular HDR technology, so all options are still open. The Ultra HD Forum meanwhile focuses on the end-to-end content delivery chain including production workflow and distribution infrastructure. In broadcasting we’ve got ATSC in North America defining how UHD and HDR should be broadcast over the air with the upcoming ATSC 3.0 standard (also used in South Korea) and transmitted via cable. Here, the SCTE comes into play as well. Japan has the ARIB (see above) and for most of the rest of the world, including Europe, there’s the DVB Project, part of the EBU, specifying how UHD and HDR should fit into the DVB standards that govern terrestrial, satellite and cable distribution. In recent news, the European Telecommunications Standards Institute (ETSI) has launched a new Industry Specification Group (ISG) “to work on a standardized solution to define a scalable and flexible decoding system for consumer electronics devices from UltraHD TVs to smartphones” which will look at UHD, HDR and WCG. Founding members include telcos BT and Telefónica. The former already operates a UHD IPTV service; the latter is about to launch one. Then there are CTA (Consumer Technology Association, formerly known as CEA) in the US and DigitalEurope dealing with guidelines and certification programs for consumer products. What specifications does a product have to support to qualify for ‘Ultra HD’ branding? Both have formulated answers to that question. It has not been a coordinated effort but fortunately they turn out to almost agree on the specs. Unity on a logo was not as feasible, sadly. The UHD Alliance has just announced they’ve settled on a definition of Ultra HD they’ll announce at CES, January 4th, 2016. One can only hope this will not lead to yet more confusion (and more logos) but I’m not optimistic. By now, the CTA has also issued guidelines for HDR. DigitalEurope hasn’t yet. It’d be great for consumers, retailers and manufacturers alike if the two organizations could agree on a definition as well as a logo this time. Includes at least one interface that supports HDR signaling as defined in CEA-861-F, as extended by CEA-861.3. Receives and processes static HDR metadata compliant with CEA-861.3 for uncompressed video. Receives and processes HDR10 Media Profile* from IP, HDMI or other video delivery sources. Additionally, other media profiles may be supported. Applies an appropriate Electro-Optical Transfer Function (EOTF), before rendering the image. CEA-861.3 references SMPTE ST 2084 and ST 2086. What are consumers, broadcasters, TV manufacturers, technology developers and standardization bodies to do right now? I wouldn’t want to hold any consumer back but I couldn’t blame them if they decided to postpone purchasing a new TV a little longer until standards for HDR have been nailed. Similarly, for broadcasters and production companies it only seems prudent to postpone making big investments in HDR production equipment and workflows. For all parties involved in technology development and standardization, my advice would be as follows. It’s inevitable we’re going to see a mixture of TV sets with varying capabilities in the market – SDR HDTVs, SDR UHD TVs and HDR UHD TVs, and that’s not even taking into consideration near-future extensions like HFR. Simply ignoring some of these segments would be a very unwise choice: cutting off SDR UHD TVs from a steady flow of UHD content for instance would alienate the early adopters who bought into UHD TV already. The CE industry needs to cherish these consumers. It’s bad enough that those Brits who bought a UHD TV in 2014 cannot enjoy BT Sport’s Ultra HD service today because the associated set-top box requires HDCP 2.2 which their TV doesn’t support. It is not realistic to cater to each of these segments with separate channels either. Even if the workflows can be combined, no broadcaster wants to spend the bandwidth to transmit the same channel in SDR HD and HDR HD, plus potentially SDR UHD and HDR UHD. Having separate channels for HD and UHD is inevitable but for HDR to succeed it’s essential for everyone in the production and delivery chain that the HDR signal be an extension to the broadcast SDR signal and the SDR signal be compatible with legacy Rec.709 TV sets. Innovations like Ultra HD resolution, High Dynamic Range, Wide Color Gamut and High Frame Rate will not come all at once with a big bang but (apart from HDR and WCG which go together) one at a time, leading to a fragmented installed base. This is why compatibility and ‘graceful degradation’ are so important: it’s impossible to cater to all segments individually. Within each segment, the SDOs need to align because having different standards for the same thing is counterproductive. It may be fine to have different standards applied, for instance if broadcasting uses a different HDR format than packaged media; after all, they have differing requirements. Along the chain, HDR standards do not need to be identical but they have to be compatible. Hopefully organizations like the Ultra HD Forum can facilitate and coordinate this between the segments of the chain. If the various standardization organizations can figure out what HDR flavor to use in which case and agree on this, the future is looking very bright indeed. Thomson Video Networks white paper: HDR & WCG – the next step for UHDTV? Yoeri Geutskens has worked in consumer electronics for more than 15 years. He writes about high-resolution audio and video. You can follow him on Ultra HD and 4K on twitter @UHD4k. This opinion blog is about 3 things that could derail UHD if User Experience lets them. My crystal ball hasn’t confirmed that this is the order in which these components will arrive, or to what extent it’ll be a big bang approach, or even if some components might get left by the wayside. I’ll delve into that in another blog. In the last 15 years or so, I’ve witnessed HD succeed and I have written several times about why I believe UHD’s time is now (recently here or here in early 2014 for example). I have nothing to sell and no vested interest in UHD, I’m simply driven by my geeky fascination with the promise of a great new experience brought to TV and IP technologies that I’ve been working with for so long. But just in case I am wrong, here are 3 things that that some of us fret about and still could prevent UHD success. Energy Extra brightness, more pixels and more images consume more power Regulation, consumer reluctance, UHD perceived as not Politically Correct Technology progress has often consumed more power (e.g. HD vs SD). Better efficiency means extra power required is less than extra user experience delivered. CPE power issue is more in standby mode than peak consumption. Need not consume much more power with HD-only signal. Bandwidth UHD can require over 4 times HD bandwidth / file size. Channel and content distribution issues. Monthly data caps will be an issue for OTT households. Networks grow in quantum leaps, UHD will help spur the next one. All-fibre connections and future 5G networks will provide more bandwidth than UHD can consume. A new generation of low-orbit satellites is also on its way. The driving force providing the impetus to overcome challenges such as those mentioned above is User Experience. This is the part of the equation I have to rely on gut feeling or faith for. My premise is that UHD ushers in a great new User Experience with a sensation of realism and immersion. If it actually turned out that UHD didn’t bring that “wow” effect so many of us in the industry believe in, then any one of the above “things” could alone derail UHD from becoming a market success and we’ll have to find another game changer in the TV industry. My experience so far suggests that UHD will be that game change but also that there are still niggles that need ironing out. As it happens I’ve been watching quite a lot of 4K TV via Amazon and Netflix in the last few months. Landscapes and close-ups are all pretty amazing, but I do have a nagging worry over some indoor scenes, which despite being shot by top-of the range pros (e.g. Amazon’s Transparent, or Breaking Bad, …) leave a strange feeling that something isn’t quite right in 4K resolution. It occurs when there is some mild camera movement yet when most of the scene is in focus. I get this counterintuitive sensation that there is something maybe amateurish in the composition. This could be due to the shooting not having been properly thought out by the director and cameraman for 4K TV playback, or maybe it’s just me not yet being used to processing so much data on screen. If either of these is true, which I suspect is the case, the issue will quickly disappear. But this highlights my only real concern over UHD’s success: will it be consistently “wow” enough to overcome resistances like the three issues stated above? If so I have no doubts that vendors, content providers and operators, as personified in the Ultra HD Forum, will be insure that the whole UHD movement is not derailed by relatively minor teething troubles.